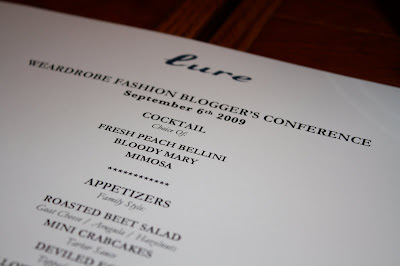 KANSAS COUTURE: Weardrobe Conference, Day 3! Sunday, the third and final full day of the conference, started out with another decadent brunch: this time, at Lure Fishbar. There was a special menu prepared just for us, and we visited with ladies from Glamour, Seventeen and Guest of a Guest. They were all so interesting and fun to talk to. Right after brunch, we made our way to the street where the talented and dashing Craig Arend of Altamira took our photographs. Before long, a crowd of people formed and took pictures of us getting our pictures taken. A disgruntled old man asked me what was going on. Photo from the conference blog. The next stop was Eryn Brinie where we paired up and styled mannequins that will grace the store's windows in the coming weeks. My partner was the sweet, smiley and oh so stylish Amy of Flying a Kite. We browsed through racks and racks of luxurious knits in the loveliest fall shades, picking our favorite pieces along the way. Amy and I were totally on the same style wavelength. Our vision was a unique layered look for fall that was bohemian at heart with a hint of city-girl edge. Photo by Sara of Style Magnet! My outfit details: Collective Clothing dress (thrifted, $16), vintage scarf (gift), Colin Stuart wedges with DIY ankle ribbons (thrifted, $5) and vintage belt (thrifted, $2.50). 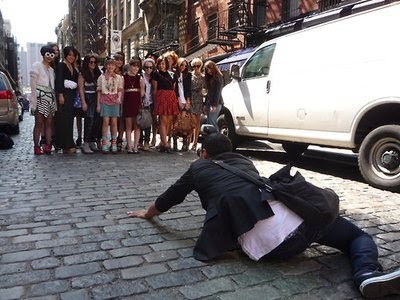 We couldn't go a whole day without shopping, so we hit up some stores in SoHo. Being the hopeless bargain-hunter that I am, I spent my time at H&M instead of the upscale boutiques. I picked up two dresses, which you will see soon. Our next event was a little more conference-y. 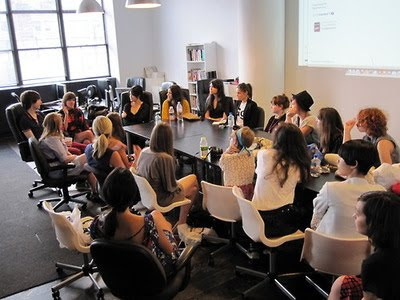 We gathered around a table for a blogging workshop with Rue La La and Tumblr. The discussions were both interesting and informative. Thank you for talking with us! For dinner, Krystal of This Time Tomorrow and I grabbed a slice of classic New York pizza and a beer. It hit the spot. Then some of the gang literally ran to the movie theater to see the September Issue, a captivating documentary about the making of the September 2007 issue of American Vogue. The film delicately and intelligently juxtaposed the personalities of the stern, decisive, sometimes ruthless Anna Wintour and the warm, romantic, whimsically creative Grace Toddington. New York Pizza.....of that alone, I am envious! Looks like you all had a great weekend! Love the pics! Great blouse and shoes! !